This is the twelfth and final post in a weekly series highlighting Italy’s four World Cup wins from qualifications to the finals. Read the eleventh post here. 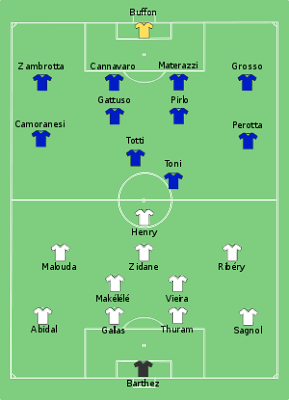 Although it has now been ten years, I remember Italy’s 2006 win like it was yesterday. And even if the events off the pitch seem to still impact Italian football, I will always remember that day when talent triumphed over greed, football over corruption. 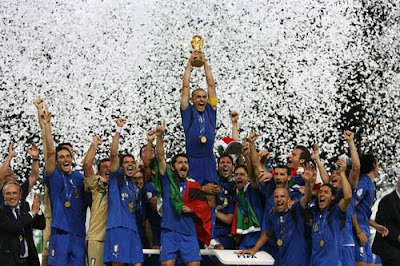 Nothing can take away the exquisite joy of Italy lifting its fourth World Cup. By far the best match of the World Cup, Germany vs. Italy should have been the final. It was all about the football, and what tremendous football it was. Played at the FIFA World Cup Stadium in Dortmund on July 4th before a home crowd of 65,000, Germany had high hopes going in to the match. The young Jürgen Klinsmann had taken this talented young squad from underdogs to national heroes, and now they were one game away from the final. Despite missing Torsten Frings due to a suspension following the Argentina match, hopes were very high. Italy had the confidence of a recent 4-1 drubbing of Germany in a friendly as well as knowing they had never lost to Germany in the World Cup. Italy once again abandoned their well-known defensive style of football for a very attack-minded first half. Keeping the Germans at bay for much of the first half, they instead focused on testing Jens Lehmann. But Germany were never out of it and had their fair share of chances, too. Buffon was also increasingly called into action during the first 90 minutes of play, which ended scoreless despite some excellent chances from both sides. Mexican referee Benito Archundia was blessed with a relatively clean match, showing yellow cards to Borowski in the 40th and Metzelder in the 56th for Germany, and a yellow to Camoranesi in the 90th. It seemed both squads were anxious to let their football do the talking, even if the match was winding into an incredible frenzy of frustrated chances matched only by their will to win. As the game went into added extra time, it seemed like both the shots and saves became increasingly good, and the pace ever more frenetic, but with no result. Both keepers showed amazing form in the face of an onslaught of shots. 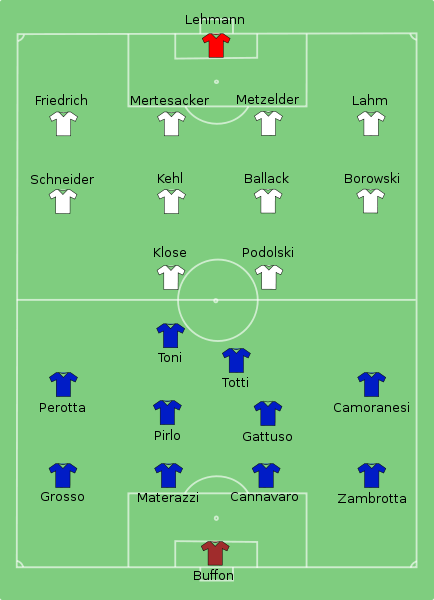 Italy were particularly determined to finish the match off in extra time, as the Germans had an excellent record in penalty shootouts, and Italy had lost in a shootout in the final in 1994. After Gilardino and Zambrotta had both hit the crossbar, it felt like something had to give, and in the 119th minute, it did. Off of a corner kick, Pirlo passed the ball to Grosso in the box who took a beautiful left-footed shot that curled around Lehmann inside the far post. His reaction was one of pure joy and was reminiscent of Tardelli’s goal against West Germany in the 1982 final. After the restart, Italy was not content to sit back for the final 2 minutes of the match, though. Gilardino passed the ball to Lippi’s genius sub, Alessandro Del Piero who chipped it past Lehmann in the 121’s and final minute to give Italy the 2-0 win. Germany was credited with 43% possession and 13 shots, with two on goal, whereas Italy had 15 shots with an incredible 10 on goal and 57% possession. Although to have watched the match, it seemed more evenly matched than that. Germany’s hopes had been raised and then crushed, just one match before the trophy. And 120 minutes of nonstop, heart pounding action saw Italy make it to the Final for the first time since 1994. In the other semifinal match, France played Portugal on July 5th at the Allianz Arena in Munich. While Portugal had the advantage in both possession and shots, France took the 1-0 victory on a penalty by Zidane to send Portugal home and book France’s place in the Final in Berlin. The third place match between Germany and Portugal was played July 8th at Gottleib-Daimler Stadion in Stuttgart before a crowd of 52,000. Oliver Kahn was playing his farewell match in goal for Germany, and it was also Luis Figo’s International farewell for Portugal. Germany secured the 3-1 win with all three of their goals being scored within 22 minutes, a pair by Schweinsteiger and a Petit own goal scored off of a Schweinstiger shot. Despite Germany surprising with a third place finish, Klinnsmann resigned following the tournament. 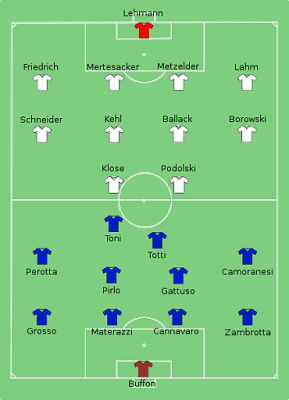 It is interesting to note that this match was a rematch of sorts of the Euro 2000 match. In that match, Italy held a 1-0 lead until a late equalizer was scored in regulation, sending it into added extra time. Their hopes were crushed with a Golden Goal in extra time, scored by David Trezeguet. Remember that name. The Final was played on July 9th in the Olimpiastadion in Berlin to a crowd off 69,000. It was a dramatic ending to a very successful World Cup. And the drama began almost immediately, when in the opening minute, Thierry Henry collided with Fabio Cannavaro and was knocked unconscious. Despite looking a little questionable, he was able to recover and play through regulation. In the 5th minute, Argentinian referee Horacio Elizondo rewarded Zambrotta’s challenge on Viera with a yellow card. In the 7th minute, Malouda, running between Cannavaro & Materazzi, tumbled in the box. I have yet to see a video angle that shows the contact required for a penalty call, but the ref did not have the benefit of video replay and gave France the penalty. Zidane converted it, putting France up, 1-0. Materazzi then almost scored an own goal, but Buffon sent the ball just wide. And in the 12th minute, Sagnol was cautioned for a foul on Grosso. Meanwhile, on the sidelines, Lippi was literally biting his nails. But not for long. Materazzi scored his second goal of the tournament, a beautiful header off of Pirlo’s corner for the equalizer, sending the Italian bench into leaps of joy. Not bad for a backup center back deputizing for an injured Nesta. It was one action-packed first 20 minutes. The next 70 minutes would prove less dramatic, even if both sides were fighting valiantly. Or was that violently? The match would end with 24 fouls whistled for France and 17 for Italy. Anyway, Toni had a few good chances before the half, including rattling the crossbar. In the 56th, Viera was injured and subbed off for Diarra. Lippi decided to make some changes and in the 61st brought on Iaquinta and DeRossi for Perotta and Totti, respectively. This did jumpstart the attack and Toni sent the ball into the back of the net from a free kick, only to have the goal waved off for offside. In the 76th, Makélélé was shown a yellow card, and in the 86th, Lippi used his final sub to bring on Del Piero for Camoranesi. It was still 1-1 at the end of regulation, so despite both sides looking very weary, it was on to added extra time. I don’t have to tell you what happened in the 110th minute, as the two goal scorers, Zidane and Materazzi, were mixing it up off the ball. Words were said, a chest was headbutted, a legend sent off in shame in his farewell match, bringing his card total to three yellows and a red, the most of anyone in the tournament. I will say this: trashtalking and physical violence are two different things. And while many of us have probably wanted to headbutt Materazzi because of dumb things that he’s said, words do not give you license to do so. Not for honor, not for anger, not for anything. I also have a huge problem with violence on the pitch that is off the ball. I don’t condone trashtalking or violence at all on the pitch, but this was completely inexcusable and for me, tarnished a football legend (no, not Materazzi!) and a game forever. Despite having a man advantage after Zidane’s sending off, Italy were unable to maximize on their extra man. They fought hard, and they kept Barthez honest, but Buffon was made to work hard, too. In the end, their worst nightmare, a penalty shootout, was going to be realized. First up, Pirlo. He stepped up and scored. For France, Wiltford. Scored. Then Materazzi, 1 part hero and 1 part villain on the night, scored. Then that guy Trezeguet, remember him from Euro 2000? Well he stepped up, and hit the crossbar. Ironic, breaking the Azzurri hearts in 2000, and now the hearts of Les Bleus in 2006. De Rossi nailed his penalty, then Abidal scored. 3-2 for Italy. Del Piero, the last sub, coolly stepped up and scored. Sagnol did his part to make it 4-3. The 5th kicker for Italy? Of course it was the hero of the semifinals, Grosso. Could he do it again? Yes. Italy 5-3 on penalties. 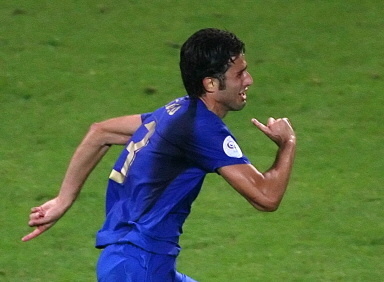 When his ball hit the back of the net, all of the Azzurri exploded with joy, running everywhere, embracing, screaming. Italy had won. 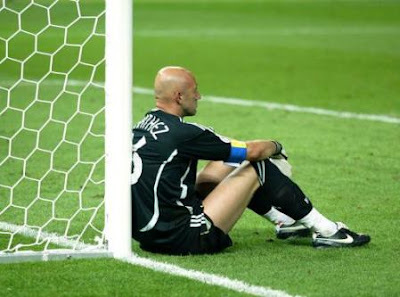 They had beaten their penalty demons, they had beaten their opponent from Euro 2000. And in many ways, they triumphed over the tragedies at home. Italy were world champions for the fourth time. Speaking of winning, often the winning team dominates the individual awards, but this tournament, they were spread around. 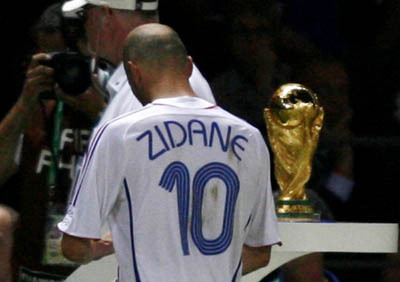 Due to the voting for the Golden Ball closing before the end of the final, Zidane was awarded the Golden Ball trophy with 2012 votes to Cannavaro’s 1977 votes. Many journalists complained that they would have liked to have changed their votes based on his unsportsmanlike behavior during the final. The Golden Shoe was awarded to Miroslav Klose of Germany, with 5 goals. The Yashin Award (now known as the Golden Glove) did go to Buffon, who absolutely deserved it, having conceded only 2 goals (not counting the penalty shootout) the entire tournament. It is also interesting to note that Pirlo was chosen as Man of the Match for the final. And not just for this match, but for 3 matches during the tournament. Legendary. Finally, an award I made up: The Golden Team award. Of course, it goes to Italy, as they had ten different scorers in the tournament. TEN. Which speaks volumes of how they earned the big one, TEAM. They showed unity and a togetherness through triumph and tragedy. Heroes. If there is one thing I learned from watching the postgame celebrations in Berlin, it’s that the Azzurri know how to celebrate a win better than any other team. With all of the pressure off, and their win a personal triumph over tragedy at home, there were no inhibitions. They ran and romped hugged and sang and put articles of clothing on and took some off, too. But for me, the ritualistic cutting of Camoranesi’s ponytail showed both the dedication of an individual and the unity of a team. Well, and it was just freaking awesome to watch, too. The smiles and laughter and tears of joy throughout that night and the following days will be forever etched into my mind. Whether this was your first Quattro Stelle post or if you have faithfully read all 12, (God bless you!!) thank you for reading. I must confess that I started this series somewhat selfishly, as I had always wanted to know more about these four spectacular World Cups. But I hope that some of you have also learned from them or at least enjoyed reading about them, too. If there is one thing I’ve learned throughout this series, it’s that it doesn’t matter if you were born in 1910 or 1980, or which club team you play for, the honor of wearing the Azzurri jersey is afforded to players with talent, determination, and heart. And when 11 players who meet this qualification take the pitch, anything is possible. If you want to read the Quattro Stelle series from the beginning, start here and follow the links. Forza Azzurri!